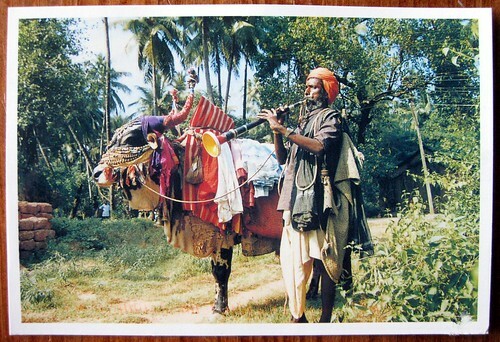 This completely awesome postcard of a fortune-telling bull in Goa, India came to me via Sendsomething.net from the excellent Sunny. I am so in love with this postcard! 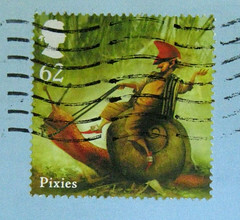 I asked Sunny, in a follow-up postcard, how the bull told the fortune, and what the man with the horn had to do with it, but he didn't know. Sounds like a very interesting concept! This postcard has a place of honor on my new refrigerator, just because I get such a kick out of seeing it every day. These guys are all over Goa! They are amazing to watch. The guy blowing the horn gets the cow to do a little dance then at the end, the cow stands (front hoofs only) on the man...its nuts! I have no idea what the purpose is other than its supposed to bring good luck if you give them money. Awesome card! Hey SweetLime, thanks so much for the explanation! That really sounds like something to see.